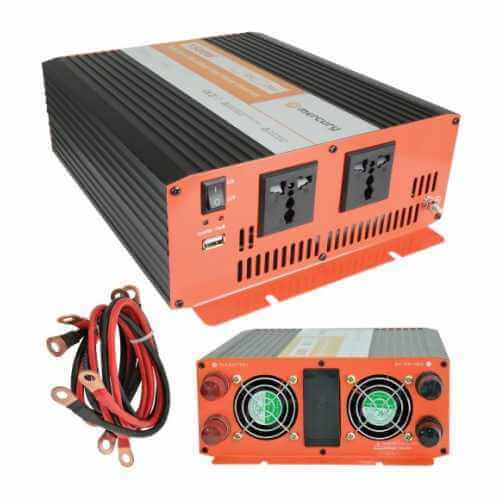 Power Inverter for Car Truck | 12V 24V to 230V | Quasar UK Superstore Need a power inverter? Massive range of high quality power inverters from 150 Watts to 2500 Watts. Convert 12 or 24Vdc to UK 230Vac mains voltage. Need a power inverter? We have a massive range of high quality power inverters from 100 Watts to 1,500 Watts output power. Convert 12 or 24V DC battery power to 230-240V AC UK mains voltage. We have Modified Sine Wave models for general purpose applications, Soft-Start models that eliminate inverter shutdowns when used with inductive loads and Pure Sine Wave models for use with equipment that cannot be powered using a modified sine wave output.